My brother and his wife visited us last week. It was great to get together with them, but I must admit things always get a bit testy between my brother and I, but only when it comes to a few topics like: food, wine, politics, movies, the weather, religion, sports, the universe, medicine, creation, clothes, art, fishing, capital punishment…. You get the picture. Sibling rivalry does not even begin to describe our relationship. And cooking together can devolve into a contact sport. Well, that may be an exaggeration, but we do get into some heated discussions. Then we kiss and make up. We can’t help ourselves. It’s genetic and comes from the Italian side of our family where no opinion ever went unchallenged. Our aunts, uncles and cousins would argue about everything, and ignorance of a subject did not inhibit us from passionately defending a less than plausible position. Those who prevailed usually did so, not through knowledge or eloquence, but because they were louder or had more stamina. Eventually, though, they (and we) settle down and do what we do best: cook, eat and drink! Among the memorable meals we prepared last week was one that was a pretty complex undertaking. It involved using a Christmas present from my brother – the Anova (a manufacturer) sous vide device – to prepare a confit of duck legs. Sous vide is a method of cooking in which food is vacuum-sealed in a plastic pouch (or baggie as we used) and then placed in a container filled with water. The Anova heating device is used to circulate the food for long, slow cooking in the water bath. The duck confit took 10 hours to cook. Of course, not every sous vide dish requires ten hours to prepare. Anova provides a cooking guide to assist in setting the circulating device to the appropriate temperature and time for the specific food you’re preparing. Once the food reaches the correct temperature, you can continue to leave it in the water bath until you’re ready to eat. This method of cooking is the absolute best way to insure that the food (particularly meat) will be at its tender best. I’ve used the Anova to cook rib-eye steaks and total cooking time in the water bath was about 1.5 hours. It’s recommended that you finish the meat on a grill or very hot cast iron skillet for one minute per side to get a good searing caramelization. The rib-eyes were among the best I’ve ever served. We cooked the seven duck legs at approximately 140 degrees Fahrenheit and, once out of the water, we pan-seared them in a cast iron skillet for about 2 minutes a side. Out of the pan, we served the duck with a blueberry gastrique (which is a fancy name for fresh blueberries sautéed with balsamic vinegar, water and sugar). We accompanied the duck with asparagus and a cheesy ramp polenta. I have to say that after all the weeping and gnashing of teeth, the meal was delicious. And the wine pairings were excellent too. We opened a 2009 Joseph Phelps Freestone Vineyard Pinot Noir ($45) and 2012 Fabre Montmayou Cabernet Franc Reserva ($22). The pinot noir is from the Sonoma Coast and the cabernet franc was made in the Mendoza region of Argentina. 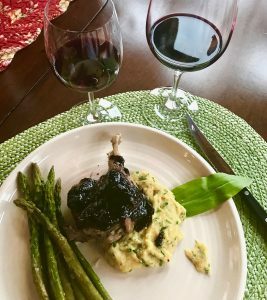 Both wines excelled as companions to the dish, but the pinot noir came out on top because it was more compatible with the blueberry gastrique. The cabernet franc was made in the medium-bodied style of a Chinon, a wine that is made from the same grape grown in the Loire Valley of France. If you’re interested in learning more about the sous vide method of cooking, you can simply check it out on the web or Google the Anova website. We Should have layered the gastrique under the duck for a better pix. Also, the beurre blanc w the aspagagus did not show up in the pix either. Hey, no mention of the tremendous flavor and texture that sous vide coaxed from what, ordinarily, would be a stringy mea dish. I drank too much- I thought the Cab Franc was an actual Chinon. What a great article. Made feel like I missed out on something great.